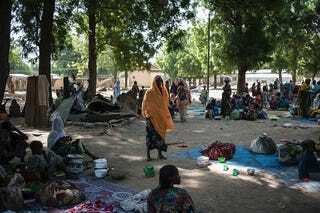 More than 100 refugees and aid workers lost their lives Tuesday after a Nigerian air force fighter jet on a mission against Boko Haram extremists mistakenly bombed a refugee camp, a Borno state official said, according to the Associated Press. Military commander Maj. Gen. Lucky Irabor confirmed the accident in the northeastern town of Rann, which is located near the border of Cameroon. Irabor said that “some” civilians were killed, AP notes. The newswire reports that it is believed to be the first time the Nigerian military has acknowledged making such a mistake in a region where civilians have reported casualties in nearly daily bombings that target the Islamic extremist group. According to AP, the Borno state official who was helping to coordinate the evacuation of the injured said that more than 100 refugees and aid workers were among the dead. Doctors Without Borders said that its team in Rann counted 52 dead and treated 120 others for their injuries. The International Committee for the Red Cross said six employees with the Nigerian Red Cross were among the dead, and 13 other employees were wounded. “They were part of a team that had brought in desperately needed food for over 25,000 displaced persons,” spokesman Jason Straziuso said in a statement from Nairobi, Kenya. Two soldiers were also injured in the bombardment, as well as Nigerians who work with Doctors Without Borders. According to AP, Irabor said that he had ordered the mission based on information that the terrorist militants were gathering in the area. He said that it was too soon to know if a tactical error had been made, but added that the bombing would be investigated.